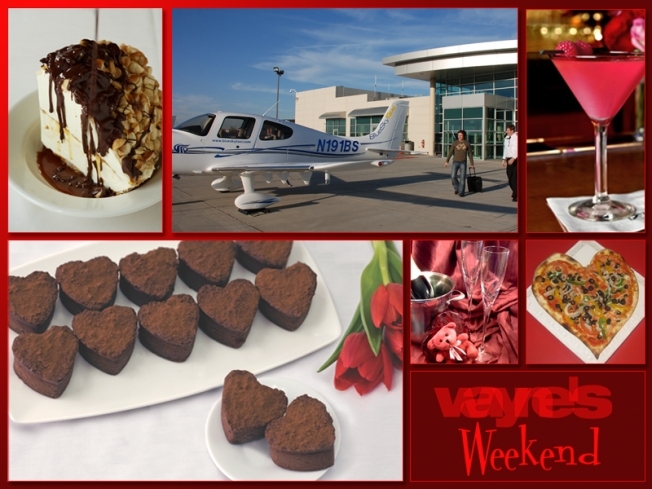 Wayne shares ideas from flowers to air travel to make your Valentine’s Day special. Wayne's Weekend: From turtle pie to a chartered flight over the city, Wayne shares unique ways to show your valentine you care. Restaurants, florists, bakeries and confectioners always prepare for Valentine’s Day. But, this year, go a bit beyond the expected and really show your partner you care by doing something a little different. Here’s a wonderful list of products and special events from a host of businesses to help you make your Valentine’s Day memorable. The grand halls of the Field Museum will be visually transformed to provide an atmospheric background for a cast of world-renowned musicians, distinguished mentalists, world-class DJ’s, and a variety of other talented performers. Stroll among a variety of exhibits and attractions while you sample handcrafted, signature cocktails and five-star cuisine. Our festival is a celebration of the love that binds humans together, making the cultural anthropology exhibits a perfect backdrop, from ancient Egyptian artifacts to Tibetan relics, and every piece of history in between. "Drinking Champagne on a Private Plane"
Wayne shows unique ways to sweeten the holiday for your sweetie. Book a romantic flight over Chicago with us! Take your loved one for a special sightseeing flight over Chicago! Your personalized tour will last for about 45 minutes. The flight path is customizable and your personal pilot should even be able to take you right over your home. Each flight includes champagne toast. BlueSky Taxi is an on-demand chartered flight service now taking reservations for your sky-high romantic interludes. Think of this as a carriage ride around the city-only now your driver is a licensed airline pilot, the horse is a four-person Cirrus SR22-G3 (the same plane that Brad Pitt and Angelina Jolie use), and instead of clopping along Michigan Avenue, you will be zipping above it. All while drinking thoughtfully arranged and chilled champagne. Blue Sky Taxi’s unique service; real one way or round trip, point-to-point air travel to more than 350 airports in the Greater Midwest, is expanding the horizons of private air travel to customers on all economic levels, not just the upper income or business executive. Blue Sky Taxi passengers can now book a one way flight without having to pay a penalty for the plane flying both ways. This is the future: safer, smaller, comfortable, customized, economic on demand air travel. 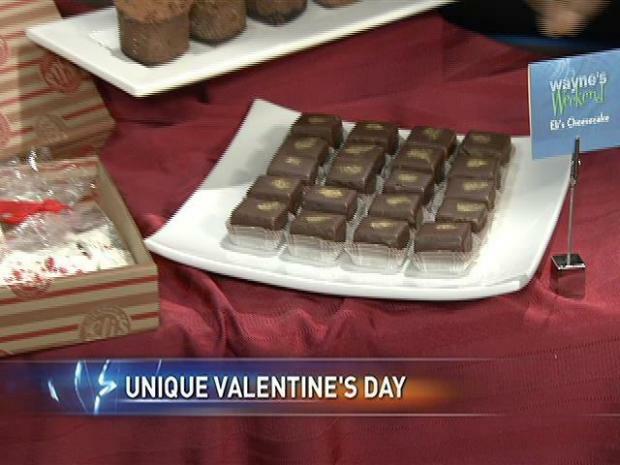 Eli's Cheesecake World, home of the famous Eli's Cheesecake, will Celebrate Valentine’s Day through Monday, Feb 14th. Eli's bakery retail store will be featuring Valentine's Day goodies including mini Belgian Chocolate heart-shaped cheesecake as well as Cheesecake Cuties created by Eli’s granddaughter, Elana. Cuties are bite-sized pieces of Eli’s Cheesecake enrobed in chocolate. Eli’s Valentine’s Day baked goods can be personalized in the store through Monday, February 14th. Marty's Martini Bar was inspired by the French painter Henri de Toulouse-Lautrec and his immersion into the decadent life of Paris at the end of the 19th century –a period, also known as, “fin de siècle” or end of the century. The special Chocolate Silk Martini will be served all evening on February 14. Gibsons Turtle Pie, always a favorite in all of its restaurants, is also a perfectly decadent gift for Valentine’s Day. A whole pie is $60 and can be purchased at any Gibsons. The Turtle Pie is so popular with some folks that one Gibsons customer spends almost $3,000 every year to have the pie shipped cold across the country for his wife for Valentine’s Day! Now that’s true love. e. melone floral. home. events. Take the time to go too your favorite florist and order a special arrangement. It’s a bit more personal and can be tailored to the tastes of that special someone. Be creative by taking some elements from home and have the florist work them into the arrangement. It will create a beautiful and lasting memory. The flowers presented today were from Matthew Harvat at e. melone floral. They are by appointment, so contact them by phone or email. 2205 W. Montrose 773.588.1550 | 5624 N. Broadway at Bryn Mawr 773.784.1550. Valentine’s Special: Any 18” Heart Shaped Pizza & Rose for $25 plus tax. Available February 13-15 and RSVPs should be in by Feb 11. There are also two additional specials: Cupid’s Dinner 18” Basic Pie, House Salad & Sweet Filoncino $30 plus tax and Sweet Filoncino Only 10” or 14”. Sometimes food becomes art, and some foods just naturally inspire. A bowl of fruit by Czanne or a dress made of meat a la Lady Gaga can impact our senses the same way the creation of a homemade, hand-tossed pizza pie can! Butter-up your buttercup this Valentine’s Day at Bistro One West and enjoy a mouth-watering prix fixe menu arranged by the talented executive chef, Doug D’Avico. For $35 per person (excluding tax and gratuity), the Valentine’s celebration starts with a glass of White Peach Purée and Sparkling Wine that can be enjoyed while overlooking the beautiful Fox River. The first course of Shrimp Ravioli in a saffron sauce is followed by the main course of Rack of Grass Fed Australian Lamb, and finished with a tantalizing Chocolate Cake with butter-cream filling and rich Valrhona chocolate sauce for dessert. Bistro One West also will offer its full a la carte menu. The Valentine’s special is available Friday, Feb. 11, Saturday, Feb. 12 and Monday, Feb. 14. Bistro One West is closed on Sunday. Be sure to enjoy the Queen of Hearts Cocktail for $9, made special just for Valentine’s Day at Bistro One West. Bistro One West is a contemporary fresh American Restaurant located at 1 W. Illinois St. in St. Charles, Ill. The restaurant is open for lunch Tuesday through Saturday, 11 a.m. to 2 p.m. Dinner hours are Tuesday through Thursday, 5 p.m. to 9 p.m.; Friday and Saturday, 5 p.m. to 10 p.m. The dining room bar is open from 11 a.m. to close. The restaurant is closed Sunday and Monday, except Valentine’s Day. For more information, contact Bistro One West at (630) 444-0600 or visit www.bistro1west.com. Follow Bistro One West on Twitter at @Bistro1West, and “Like” them on Facebook at www.facebook.com/BistroOneWest. Provo’s Village Bake Shoppe, known for its European baked goods, is offering a number of heart-shaped treats for your sweetie, including individual sized Heart-Shaped Vanilla and Chocolate Cakes, both topped with chocolate frosting ($4 each); Red and Pink Heart-shaped Sugar Cookies ($1 for small, $2 for large); Assorted Red, Pink and White Butter Cookies in heart shaped containers ($4 per box); and a set of Six Heart-shaped Kolachkis with strawberry, raspberry and cherry fillings ($6). Contact Provo’s at (312) 207-1261. Award-winning Vanille Patisserie features a Heart-Shaped Valentine’s Box filled with assorted chocolates. A small half-pound box is $27, and the large one-pound heart box is $45. Vanille also offers Pink Raspberry Eclairs for $3.50 each. Vanille’s Valentine’s Day treats are available beginning Feb. 7. Contact Vanille Patisserie at (312) 575-9963. Pick up fresh 8 ounce Lobster Tails ($12.49 each) or King Crab Legs ($29.49 per lb.) from City Fresh Market (market price) and surprise your honey with a romantic stay-at-home dinner. Other Valentine’s specials include 1.5 lb. Live Lobster, $10.99 each; Sea Wet Scallops, $13.49 per lb. ; and Blue Diamond Shrimp, $20.99 per lb. City Fresh Market is a European market with a focus on fresh poultry, fish and grass-fed beef raised without antibiotics or hormones. City Fresh also offers a variety of other meats, fruits, vegetables, cheese and meat pies, fresh-squeezed orange juice and a selection of grocery items including olive oils, vinegars, salad dressings and more. Contact City Fresh Market at (312) 575-0230 for more specials. Stop by Lavazza Espression for a Limited Edition Cup set based and an exclusive 2011 Lavazza calendar, centered around the Valentine-appropriate theme of “Falling in Love in Italy.” Only 200 of the Limited Edition Cup sets exist in the U.S., which includes two espresso cups and saucers, two cappuccino cups and saucers, as well as four stainless steel heart-shaped spoons. The exclusive 2011 desk calendar, shot by one of the most lauded celebrity photographers, Mark Seliger, is also included in this special gift set. Celebrities featured in the 2011 Lavazza calendar include Olivia Wilde and her husband Tao Ruspoli. This limited edition gift ($39.95) is a unique surprise for your espresso loving Valentine. Chicago Organics is selling specialized gift baskets from NOR, a Chicago-based business that sells natural and organic gifts and everyday essentials for eco-conscious lifestyles. The gift baskets range from $28 to $116 and are filled exclusively with organic and natural specialty food, gifts and travel sets with chemical-free skincare and beauty products, plus accessory items for the home. Les Fleurs makes it easy to catch the train and surprise your sweetheart with a special floral bouquet. Customers can purchase their flowers in the morning on Valentine’s Day and Les Fleurs can prepare them for an evening pick up. Pre-made bouquets and gifts are also ready to go. No fuss, just love on the run! Les Fleurs welcomes pre-orders and delivery. Contact Les Fleurs at (312) 463-1111. There is nothing sweeter than saying “love” with a box of chocolate. Canady le Chocolatier features luscious chocolates packaged in one pound, half pound and petite gift boxes, constructed with hand-made Thai parchment paper imprinted with an orchid and soft green leaf design. These stunning gift boxes are made exclusively for Canady le Chocolatier’s fine line of chocolates, which includes a choice of rich dark, milk or white chocolate coating with a variety of fillings, including ganache, soft caramel and sugar cream. Contact Canady le Chocolatier at (312) 454-8700. Delightful Pastries creates authentic European pastries made with local ingredients. Choose from specially decorated vanilla and chocolate cupcakes, three types of cakes decorated to say “I Love You” and decorated butter cookies. Pastries will be boxed and ready to go. Contact Delightful Pastries at (312) 234-9644. Chicago French Market is a European-inspired market offering an array of local produce, meats, seafood, breads, pastries, cheese, wine, chocolates, pastas, artisan-made goods, specialty drinks, flowers, prepared meals and a seating area for customers. Chicago French Market’s diverse group of local vendors stay open year-round, six days per week, and is located within the new MetraMarket development at 131 N. Clinton St. (between Washington and Randolph Streets). Chicago French Market offers complimentary garage parking with entrances at 164 N. Canal St. and 165 N. Clinton St. for one hour or less with a minimum purchase of $20 or more (receipt required). Please note that from January 2011 through May 2011, if traveling westbound on Randolph Street, the Randolph Street bridge is closed due to the Wacker Drive Reconstruction Project. The minor detour will reroute drivers to head north on Franklin Avenue, then west on Lake Street, to turn south on Clinton Street to access the garage. For more information, visit www.chicagofrenchmarket.com. Follow Chicago French Market on Facebook at www.facebook.com/ChicagoFrenchMarket and on Twitter at @ChiFrenchMarket. Filet mignon with Madeira sauce, giant black tiger shrimp stuffed with crab and topped with bacon and lemon garlic butter sauce for $98.95. Served with butter poached Portobello mushrooms and parmesan cheese mashed potatoes with choice of Fleming’s, Caesar or Wedge Salads. Suggested pairing: Rodney Strong, Merlot Sonoma County, 2006/2007; not included in price. Prime New York steak served with peppercorn sauce and shrimp scampi with chimichurri herb pesto for 89.95. Served with lemon-scented orzo pasta, French green beans with porcini essence with choice of Fleming’s, Caesar or Wedge Salads. Suggested pairing: CATENA, Malbec Mendoza Argentina, 2008; not included in price. After dinner, the Red Velvet Cake & Chocolate Dipped Strawberries will send sparks flying between the table as this three-layer red velvet cake is served with strawberry cream cheese frosting and garnished with two double-dipped chocolate strawberries. For $9.50, this delicious dessert serves two and tastes great paired with FONSECA, Reserve Porto Bin 27 Portugal NV. Be sure to toast that special someone with the Tickled Pink cocktail. This 99-calorie cocktail is made with Belvedere Vodka, orange juice, raspberry and Mionetto Prosecco for $9.95. To put a fabulous end to a romantic night, every couple receives a $25 Valentine’s Card that may be redeemed for any dining purchase at Fleming’s Prime Steakhouse & Wine bar, valid through March 31, 2011. Nationally acclaimed Fleming’s Prime Steakhouse & Wine Bar offers the best in steakhouse dining – Prime meats and chops, fresh fish and poultry, generous salads and side orders—with a unique wine list known as the “Fleming’s 100™” that features 100 wines served by the glass. Fleming’s was launched in Newport Beach, California in 1998 by successful restaurant industry veterans Paul Fleming and Bill Allen. Today there are 64 restaurants nationwide. Fleming’s is the recipient of numerous prestigious awards, including Wine Spectator’s annual Awards of Excellence, and Wine Enthusiast’s annual Awards of Distinction. For more information about Fleming’s Prime Steakhouse & Wine Bar and the Fleming’s 100, please visit http://www.flemingssteakhouse.com/. Add some spice to Valentine’s Day this year at Guanajuato. Choose from the every day menu or try a romantic Valentine’s Day special like Butterfly-cut Grilled Chicken Breast on a bed of green pipian (mole). Served with Mexican rice, arugula and cherry tomatoes and garnished with rose petals ($21.95). Pair any dish with a Valentine’s Day margarita, including specialties like the Mango and Blood Orange Margarita with a little paprika for spiciness ($10) or the Acai Pomegranate Margarita ($9). Guanajuato is a contemporary Mexican restaurant located at 73 Green Bay Rd. in Glencoe, Ill. The restaurant is open for lunch and dinner 11 a.m. to 10 p.m. seven days per week. The bar is open Monday-Wednesday, 4 p.m. to 10 p.m.; Friday, 4 p.m. to midnight; Saturday, noon to midnight; and Sunday, noon to 10 p.m. For more information or to make a reservation, contact Guanajuato at (847) 242-0909 or online at www.myguanajuato.com. Follow Guanajuato on Facebook at www.facebook.com/myguanajuato or on Twitter at @MyGuanajuato. Relax and unwind this Valentine’s Day at romantic Restaurant Michael. Offering a $75 per person (excluding tax and gratuity) prix fixe menu featuring Perrier-Jouet Champagne, appetizers options include Pan Roasted Diver Scallop, Warm Corn and Tarragon Blini, over Ragoût of Braised Beef Short Rib and Tarragon Scented Spatzle; Warm Terrine of Exotic Mushrooms, Veal Mousse and Black Truffle, served with a Truffle Vinaigrette; or Potato, Foie Gras and Poached Quail Egg Ravioli, served with Port Wine Veal Jus. Delectable entrées include: Filet of Dover Sole and Lobster “En Croute,” served with a Hazelnut Lobster Bisque Sauce; Roast Rack of New Zealand Lamb, with Truffled Potato Croquettes, Brown Butter Brussels Sprout Leaves and Natural Jus; or Roasted Filet of Beef Tenderloin, served with Preserved Tomato, Provençal Tian of Vegetables and Roasted Fingerling Potatoes served with a Sauce Béarnaise NOUVEAU. Finish the meal with something savory and sweet: “Not your Italian Mama’s Tiramisu” Bombe with Espresso Gelato; Hot Chocolate Soufflé, served with Pistachio Covered Butterscotch Gelato Truffle; or Grand Marnier Chocolate Truffles and Perrier-Jouet Grand Brut, NV Champagne. Reservations are required for this special Valentine’s Day prix fixe dinner. Contact Restaurant Michael at (847) 441-3100. The Valentine’s Day prix fixe dinner is available, along with the regular menu, Friday, Feb. 11, Saturday, Feb. 12, Sunday, Feb. 14 and Monday, Feb. 14. Valentine’s Day, Monday, Feb. 14, only the Valentine’s Day prix fixe dinner will be available. Restaurant Michael serves classic haute cuisine in a contemporary presentation with French country flair. The restaurant is open for dinner Tuesday through Thursday 5:30 p.m. -10:30 p.m.; Friday and Saturday 5:30 p.m. -11:30 p.m.; and Sunday 4:30 p.m.-9 p.m. Call for seasonal hours. Complimentary parking is available. Major cards accepted. Be sure to “Like” Restaurant Michael on Facebook at www.facebook.com/RestaurantMichael and follow Michael on Twitter at @RestoMichael. Visit www.restaurantmichael.com for more information. White Castle does that "Champagne Taste on a Budget". Treat and Bubbly (or sparkling juice for the kids) with every brunch purchase! Situated in the picturesque Wicker Park neighborhood in Chicago, Alliance Bakery features fine European pastries and desserts, custom-designed cakes to suit any occasion, and a full espresso bar. 'Eat your heart out" | "I love me more" | "Careful, I break easy"